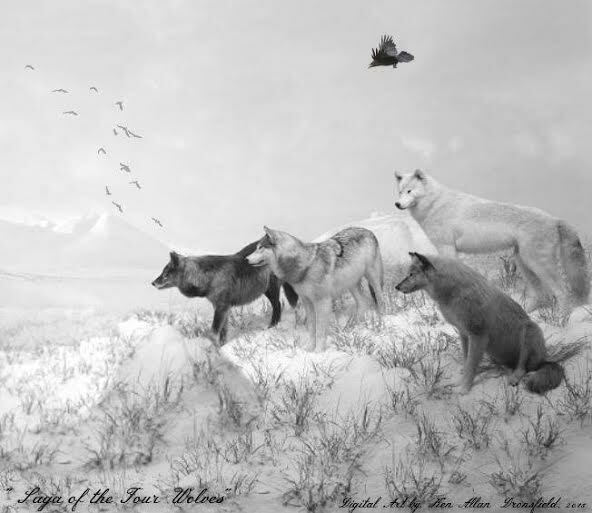 Flash Fiction andThree Poems By Ken Allan Dronsfield: "Saga of the Four Wolves", "Flawed", "Tear in the Mist", "Youthful Flame"
Ken Allan Dronsfield is a Published Poet/Author/Digital Artist originally from Hampton New Hampshire, now residing in Oklahoma. He has been writing for many years and enjoys spending time hiking, playing guitar and spending time with his cats Merlin and Willa. His published work can be found at numerous print venues. "Many, many years ago, there were four wolves out hunting. The largest was a huge male known as Mankito; he was all black and was as large as any wolf could be. The second wolf was named Timka and he was a large gray and brown wolf; the third wolf was named Rokca and was a beautiful red and brown wolf. Lastly, the fourth wolf was named Ziztu and he was a very small white wolf; the others constantly teased him and jokingly named him "little one". One afternoon, while on the trail of a wounded Elk in late October, the pack rounded the bend near a half frozen river and ahead of them they could see humans with rifles raised, the wounded Elk bounded off to the left, leaving the four wolves out in the open. The wolves ran for the tree line with Mankito leading while Timka and Rokca running as fast as they could. Gunfire was heard echoing across the valley and bullets flew all around them hitting rocks and trees but none of the three were hit. Making it to the trees for cover, Mankito looked all around but could not see little Ziztu, the beautiful white wolf. Figuring he was killed by the hunters, he raised his head to the sky and howled his strongest and longest soulful cry. Miraculously, a few moments later, here trotted the "Little One", coming up from the edge of the river; and not one shot rang out as he walked into the trees and up to Mankito. The others howled with excitement that the little wolf was okay. Mankito walked up, nose to nose and asked, "why my little brother did the hunters not shoot at you? You walked all the way up here, and not even one shot. Tell me why?" Ziztu looked up at Mankito and said, "to be my size is to be but a white fox to the humans ... and they are not interested in shooting the white fox, only the wolves." All four wolves howled and ran up into the high country. They do not pick on little Ziztu anymore. He has now begun leading successful hunting parties and is considered the bravest of all within the Pack." Moral of the Story: "the smallest is not always the most timid or weak, don't believe me? Try sleeping in a dark room with a hungry mosquito all night." a melody hugs and tugs at my soul. in this fog I feel you nearer. to serenade my dispirited heart. embrace the spirit that is you." where the tall trees dance. Poet David Allen Responds to "Deforestation"
Poet Elizabeth Brooks Responds to "Image Defined"
Poet Don Beukes Responds to "Entangled"
Poet Janine Pickett Responds To: "Distress"
A Poem by Linda Lichte Cook: "Flat Land"
A Poem By Jocelyn Zarco: "This Ground Beneath Me"
Fiction By Matthew Fort: "Hemispheres"
Flash Fiction By Belinda Hubert: "Edges"
Fiction By Jenny Sturgill: "The Torn Dress"
CNF/Essay By L.D. Zane: "Caught"
Essay By Raymond Greiner: "Where is my Garden?"